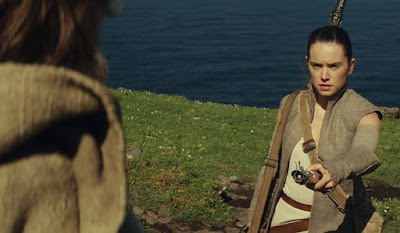 Last week when Lucasfilm announced that production had begun on Rian Johnson' Star Wars Episode VIII with the awesome teaser video featuring Johnson on set with Mark Hamill as Luke Skywalker and Daisy Ridley as Rey, fans immediately began debating whether or not that was new footage shot by Johnson for Episode VIII or simply unused angles shot for the iconic final scene of The Force Awakens. Today, Lucasfilm's Pablo Hidlago confirmed (more or less) on Twitter that it was new footage shot by Johnson for Episode VIII that was seen in the teaser. @SteeleWars I'd say the presence of a certain director on it should make it clear enough. This raises the question, will Episode VIII pick up immediately where Episode VII left off? If it does, it would be a first for Star Wars films (which typically have at least a year in between). Big thanks to our buddy Steele Saunders of the Steele Wars Podcast for getting that answer from Pablo! Thats new for a StarWars movie you think? Nothing wrong if it does pick up right where it left off. I'd prefer if it did. Too many people get hung up on it must be this way it isn't Star Wars. It is a continuation. But wasn't it confirmed that Johnson directed the final sequence in TFA? Not saying Pably is misdirecting us, but that statement alone doesn't necessarily mean what he implies it means.